The massive fire that engulfed Notre Dame Cathedral in Paris caused devastating damage to the structure, destroying its iconic spire and reducing its ancient wooden roof to ash. But Tuesday morning, as the sun rose over the city, much of the church's medieval stonework was still standing, and many people began to think about rebuilding. "It's going to be a case of assessing the damage, strengthening everything that's there, do a full inventory of what we've lost, and then find the building materials," Dr. Emily Guerry, Senior Lecturer in Medieval European History at Britain's University of Kent, told CBS News. "In the modern world, we don't build like we used to." The roof and spire of Notre Dame, which was completely incinerated in Monday's fire, were made of ancient oak. There were 13,000 beams in the church's ceiling, and Guerry said about 3,000 trees would be needed to replace them. "In the Middle Ages ... it was possible to find huge amounts of beautiful strong oak," but overuse of the material led to the destruction of many of Europe's oak forests," Guerry said. "The ability to find around 3,000 more big, strong trees in the next two decades is going to be tricky." But Guerry said the very tall, old trees needed for the project might exist in the Baltic, where most of Europe's oak comes from today. "We need carpenters with the skill set to spot the right trees, treat them properly, and then erect them into this beautiful fan-like fabric," she continued. "These skills aren't really common in the modern age, but I'm sure there are really talented people out there that will be hurrying to do this job for Paris." The limestone used to build Notre Dame Cathedral "is considered some of the best in the world," Guerry told CBS News. She said the space above and around the cathedral's vault needs to be rebuilt, and the lateral walls need to be re-strengthened. Originally sourced from Normandy in the 12th century, the Notre Dame stone was all quarried and assembled by hand. "There will need to be a whole new system of quarrying the same stone (by hand) to create the homogeneous effect," Guerry said. "It requires literally tons and tons and tons of stone. So we're going to need the best stone masons on the planet, and we're going to need the best quarries and access to them immediately." On Tuesday, the state of Notre Dame's stained glass windows was still unclear. Some had melted in the flames, but others reportedly remained intact. Restoring the cathedral's windows "is going to be an incredibly difficult and delicate effort," Guerry said, because the heat will have warped whatever glass remains. "We're going to need glaziers to go up and individually remove all of the (individual pieces of glass) and take them down off site, clean them, restructure them, fill in the missing gaps, assess what's been lost, and then reinsert," she said. "Fortunately," added Guerry, the region is home to "the world's best glaziers, who are trained using 12th century techniques, with the skills to make it beautiful and wonderful." Reconstruction of Notre Dame will take around "40 years, if we're very fast maybe 20 years, but it will be a generation. This is going to be a huge communal effort. The cost will be exorbitant," Guerry said. On Tuesday, hundreds of millions of dollars had been pledged to help rebuild the cathedral by corporations and individuals, including oil company Total and the billionaire François-Henri Pinault, who is CEO of the parent company of fashion brands like Saint Laurent and Gucci. French President Emmanuel Macron announced a Cabinet meeting for Wednesday to discuss the plan for the restoration, with an afternoon session dedicated specifically to fundraising. Governments including the U.K., Spain and Russia also offered solidarity and assistance. Notre Dame Cathedral is owned by the French state and it — along with some other historic buildings — is not insured due to cost constraints, local media reported. "Watching the spire on fire fall in real time is something that, as a medieval art historian, I could barely stomach," Guerry said. 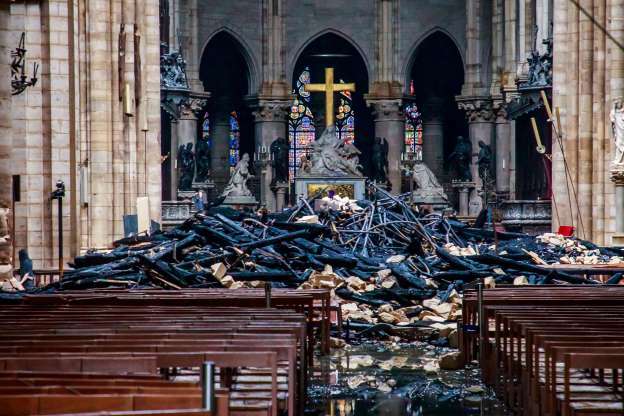 However, seeing that much of the structure remained standing on Tuesday morning, "made me feel deeply connected to all the people in the medieval past who felt like, even if there was a terrible fire ... if some things are still there, it's just this feeling of miraculous relief."